Japanese government plans to invest in port development in three Indian Ocean nations — Myanmar, Sri Lanka and Bangladesh — as part of Prime Minister Shinzo Abe’s “free and open Indo-Pacific strategy”, informs The Jakarta Post. 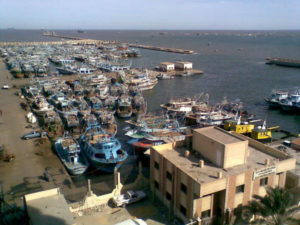 The project aims at securing the sea lanes linking Asia and Africa via the Middle East. The three sites that are under consideration for port development are Dawei in southeast Myanmar, Trincomalee in northern Sri Lanka and Matarbari in southeast Bangladesh. In Dawei, Japan, Myanmar and Thailand plan to jointly construct a new port and a special economic zone, the project’s cost is estimated up to JPY 200 bln (USD 1.83 bln). Besides, a highway will be built between Bangkok and Dawei, ultimately leading to a new economic bloc. A currently existing small port of Trincomalee on the northeast coast of Sri Lanka will be expanded by Japan, Sri Lanka and India into a trade port to be able to handle large vessels. The cost of this project is expected to be about JPY 10-13 bln (around USD 115 mln). To strengthen the port logistics capacity of Bangladesh, a new deep-sea port will be constructed in Matarbari, 100km south of Chittagong, at a cost of several tens of billions of yen. It is envisaged that the new port will serve as a hub that will unload half of Bangladesh’s cargo volume, ultimately leading to development of the surrounding areas and to acceleration of logistics with neighboring countries. The Japanese government has already initiated discussions with each government regarding the plans and intends to sign formal agreements as early as next year. The Japan International Cooperation Agency (JICA) has started making draft plans for development. Obviously, these projects highlight the concerns of Japan and other nations over China’s growing footprint in the region. China has obtained the right to use Hambantota Port in southern Sri Lanka for 99 years, and also supports the development of harbors in Pakistan, Bangladesh and Myanmar. 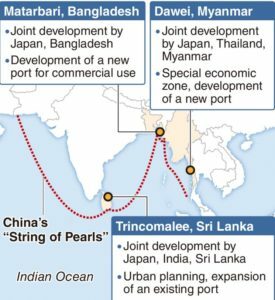 Its major role in infrastructure development in the Indian Ocean countries based on the announced “String of Pearls” maritime strategy raises concerns, particularly in Japan and India, which a year ago announced the launch of their own joint initiative, the Asia-Africa Growth Corridor (AAGC). As we wrote earlier, AAGC is meant to be a sea route from Japan to Africa, taking in the ports of India and those of other South-East Asian countries. It looks like India and Japan are bound to compete with OBOR in the Indian Ocean building ports in friendly nations to expand mutually and reinforce trade. It is also reported that China had sought the construction of new ports around Dawei and Matarbari as well but failed to make progress because of the Japanese plans.